GMorts Chaotica gives us a look inside the Nightmare Whiskey Golem for Malifaux in this new article. Looking for a handy way to transport your whisky? 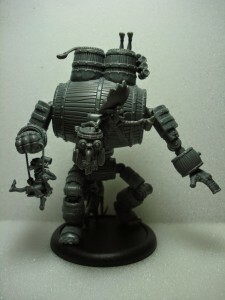 The Nightmare Whisky Golem box contains enough parts for one miniature...namely the Nightmare Whisky Golem. It also contains a stat card for him though there are no upgrade cards.